Trying to get a healthy start to 2015? 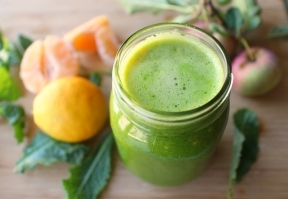 Avoid trendy juice “cleanses,” say health experts. Why? Because at best, they’re a waste of time, and at worst, they could actually harm you, The Washington Post reports. During the past few years, the idea of a juice “cleanse” or a “detox” emerged as a popular diet option. The plans consist of replacing meals with specific combinations of vegetable and fruit juices marketers say help to “detoxify” the body. But here’s the thing: Your body (specifically, your liver and kidneys) routinely detoxifies itself each day. What’s more, to date there is no scientific evidence that drinking more water or eating certain foods can speed up this process. In addition, certain types of detox diets, such as long-term fasting, can actually make it harder for the body to cleanse itself. That’s because eating less means fewer bowel movements to eliminate the toxins accumulated in your body’s waste. Juice fasts are also very dangerous for people with problems regulating their blood sugar. These regimens may even temporarily slow down your metabolism. That means any weight you may have lost during your cleanse is likely to come back quickly. In general, if you’re on a mission to become healthier, experts say eating a wide variety of foods and exercising more is still your best bet.